Jordan, a crossroads of majestic landscapes and ancient history, ideal for an intense and highly formative photographic experience, constantly in direct contact with a disconcerting nature. A carefully designed program to get to know, photograph and be overwhelmed by the irresistible charm of this part of the world, the Middle East. Another part of the world, a different culture, a morphology of the unique territory. 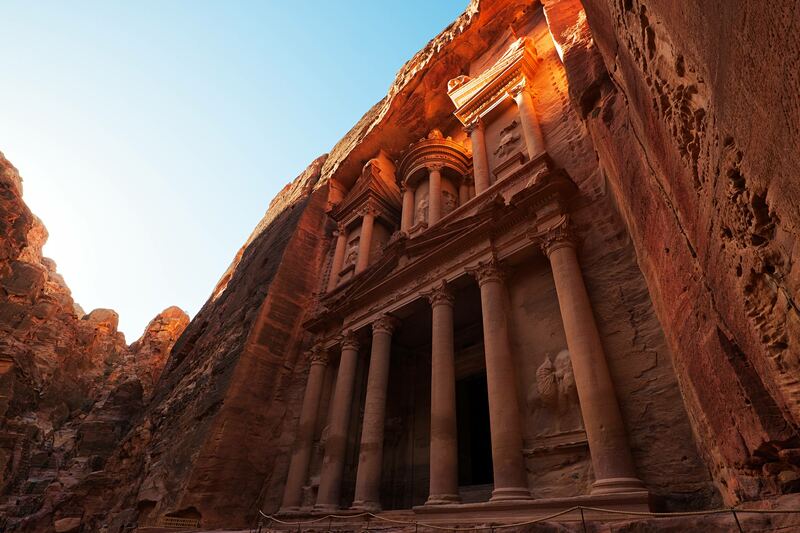 Jordan is an extraordinarily fascinating land: located in the fertile crescent region, largely made up of deserts and wide plateaus, it has always been the natural corridor for journeys from East Africa to Asia and Europe. Its places, full of history and references to the past, the surprising landscapes and glimpses suspended in time that constantly overlook the passage of the traveler, make it a privileged stage for a stage of photographic deepening in the field. This workshop, aimed at developing in the participants a new sense of "feeling" the landscape, is organized to make landscape photography in the most famous (and some unpublished) scenarios of Jordan. The planned itinerary, the result of an in-depth knowledge of the places, will move from the capital Amman to the south, along the splendid road of the Kings and then enter the silence of the Wadi Rum desert, where for two days we will move in 4x4 in search of better ideas, staying in tented camp. We will then leave for the inevitable Petra, where we will have all the time necessary to enjoy the incredible scenery that its "treasures" offer. The shores of the Dead Sea, the largest depression of the Planet (-400mt) will then frame the last day of shooting, in the enchantment of unimaginable shapes and colors. Particular attention was paid to making constant contact possible with the meanings of this area of ​​the Middle East, in order to allow a complete understanding of it. Photographic training in the field, continuous review of the work done with HD projections, insights on history, customs and traditions, will transform this photographic adventure into a fulfilling and unforgettable moment of life. No difficult walks are planned. Possible easy walks in the nature for about 3 hours. Amman, Wadi Rum desert, Beida, Petra, Dead Sea. 30%registration down payment by July 10, 2018. Day 1: 09/12/18 Arrival at Regina Alia Amman international airport (AMM), transfer to the hotel in Amman. Dinner, illustration of the Workshop, overnight. Day 2: 09/13/18 Early morning set off to Wadi Rum desert running across the amazing King's road. Shooting on the road in several locations (Madaba, Kerak castle, mount Nebo, scenic views). Quick free panoramic lunch. Afternoon arrival at tented field in the Wadi Rum desert. Typical dinner and overnight. Day 3: 09/14/18 First 3 hours 4x4 photo tour in Wadi Rum desert best locations (set off 45 minutes before sunrise). Tea in the desert. Back to the tented field. Lunch (included). Revision of the done work. Second 3 hours 4x4 photo tour in the desert, until and after sunset. Back to the tented field. Dinner and overnight. Day 4: 09/15/18 Third 3 hours 4x4 photo tour in Wadi Rum desert best locations (set off 45 minutes before sunrise). Tea in the desert. Back to the tented field. Set off to Petra archeological area. Shootings on the road. Free lunch. Visit of Beida, the little Petra. Afternoon arriving to Petra hotel. Dinner. Revision of the done work. Overnight. Day 5: 09/16/18 All of the day dedicated to photo shootings inside Petra. Dinner and overnight in hotel. Day 6: 09/17/18 Early morning shooting in Petra. Back to the hotel and set off to Dead Sea, running across scenic path. Afternoon arriving at 5 stars Dead Sea hotel. Shooting until sunset. Relax. Dinner, revision of the done work, overnight. Day 7: 09/18/18 Morning set off to Amman international airport. Return flights. FLIGHTS: Flights are not included in the workshop price. As soon as the minimum number of participants is reached, the tour will be confirmed and it will be possible to purchase your tickets. Once the trip is confirmed, timetables for departures and arrivals will be given, which all participants absolutely have to follow. The organization cannot guarantee to pick up delayers or take participants to the airports before the due schedule. The arrival/departure airport is Amman International Airport "Regina Alia" (AMM). CONSULAR VISA: Included in the price of this workshop, the consular Visa procedure forecasts the sending of a passport copy to the tour operator before of the tour. SINGLE ROOM SUPPLEMENT € 250. The trip price provides for a double room treatment. A request for a single room accommodation, considering the limited vacancies, will be managed with a chronological request order and implies this supplement. The participants will always be assisted in searching for a roommate. If there are no availabilities, you will be promptly informed, and the fee from a double to a single room will change accordingly. ADDITIONAL FOR SMALL GROUPS: the trip price has been estimated basing on 6 participants. If this number is not reached at the registrations deadline, the participants will be proposed a reschedule of prices, for a reduced group of 4-5 people. In tented field single occupancy is not available.